We’ve just returned from the Natural Products Expo East in Baltimore. One of the featured guests at the show was activist Laurie David. Laurie’s new book, The Family Dinner, draws on one of Laurie’s passions: creating more awareness about the importance of the family dinner to the health and well-being of both children and parents. We’re all for this crusade, and also appreciate her tips to help make it easier for you all to start, keep, and pass on this tradition in your homes. We have a Cooking with Kids article on our website offering you ideas for ways you can creatively engage your kids in the kitchen. We’ve found that involving them in the process makes them want to share the meal afterwards all that much more. And while sharing the responsibilities of cooking with the younger people in your life, introduce them to the fun of using spices. It’s a great way for them to use their creativity and curiosity to dream up new and interesting dishes, which in turn keeps them coming back for more fun and sharing. This recipe dresses up peas with spices and pasta. 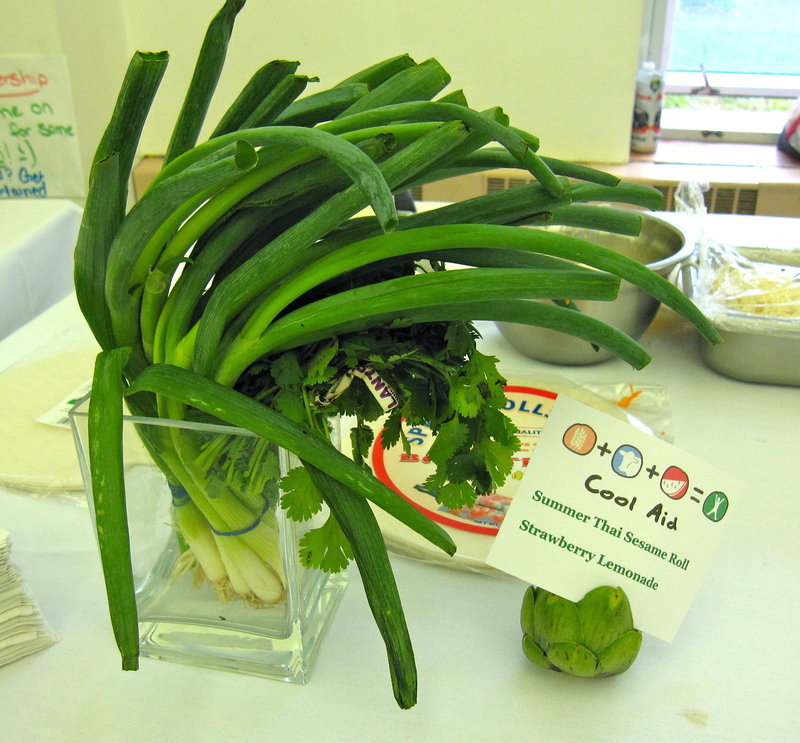 It’s a good way to integrate farmer’s market goodies into the lessons in the kitchen, too. Give it a try and let us know what happens! You can add any garden-fresh veggies (like cukes, peppers, green beans, tomatoes) to this salad staple. Combine pasta, peas and carrots together in a serving dish.In a small bowl or jar, whisk together remaining ingredients (except pepper). Pour dressing over pasta combo and mix well. Sprinkle with pepper. Please share your family meal ideas with us. Did you grow up in a house where this was a priority? How do you make sure you all sit down together in your house? Do you see the benefits? As we did on Mother’s Day, we headed to the Farmers Market to take some photos of dads enjoying their special day. We knew it was going to be a fun excursion when this was the first thing we saw. Hope you had a wonderful day, dads! Last night we attended a gathering we told you about earlier: Cool Aid! a fundraiser at the Onteora Middle School/High School Cafeteria, in Boiceville New York. Cool-Aid proceeds will fund the purchase of a walk-in freezer for the central kitchen of the Onteora Schools. The walk-in freezer will allow the cooks at the school to effectively extend the growing season for locally sourced produce, reduce waste of plentiful fresh foods, and increase nutrition by freezing fruits and vegetables picked at the height of their nutritive value. We’re here to say the event was a great success! Maxanne Resnick and a large group of volunteers worked to bring the idea to life. This group included students who helped serve and did an impeccable job keeping the tables clean. The line-up of local chefs provides a look at the array of culinary talent and the intriguing regional cuisine in this area. The chefs included Dan Leader, Giovanni Scappin, Curt Robair, Bill Warnes, Ric Orlando, Devin Mills, Pika Roels, and Kevin Katz. The chefs were paired up with a regional farmer of their choice and two students, and together they served up tasty and healthy foods that anyone, especially kids, could make. Each hors d’ouevre was $2 each, and trust us, we ate like kings. The live music, silent auction, food crafts for kids, juicer and smoothie bars, plus an array of other presentations made this an event for all ages. Watching the members of the community chat and enjoy great food together made it fun and memorable. Check out some photos from the evening. More details about the chefs. Frontier was happy to help sponsor the event, and we hope this idea might inspire you to find ways to help schools or any other institutions in your area move towards using more fresh ingredients from local sources. Please let us know about your local food projects! Mother’s Day and the first outdoor Farmers Market of the season. We hope you all had a beautiful day. One of the most wonderful things about living in New York’s Hudson Valley is our proximity to so many dedicated local organic farmers and to the creative chefs who use that produce in their restaurants. One group of these chefs and farmers is planning an interesting benefit that we’d like to share with you; it might just inspire you in your own community. Cool Aid! is A FARM TO TABLE FAMILY EVENT to be held on Monday, May 23rd in the Onteora Middle School/High School Cafeteria, in Boiceville New York. Cool Aid proceeds will fund the purchase of a walk-in freezer for the central kitchen of the Onteora Schools in Boiceville, NY. Here’s where it gets interesting. A walk-in freezer will allow the cooks at the school to effectively extend the growing season for locally sourced produce, reduce waste of plentiful fresh foods, and increase nutrition by freezing fruits and vegetables picked at the height of their nutritive value. The school feels this will aid their ability to deliver healthy foods to their students, without a huge outlay of money. In planning this fundraiser, they looked for a way to do something educational, interactive and fun, linking school-age kids with area chefs and farmers. Since the school enrolls students kindergarten through 12th grade, the goal was to get all levels involved. Here’s what they came up with: An event in which eight local chefs will be paired up with a regional farmer of their choice and two students, who will help execute the assembly of a tasty and healthy food that’s easy for kids to make and fits perfectly into a student’s lunchbox. The line-up of chefs provides a look at the array of culinary talent and the intriguing regional cuisine in this area. The chefs include Dan Leader, Gianni Scappin, Curt Robair, Bill Warnes, Ric Orlando, Devin Mills, Pika Roels, and Kevin Katz. 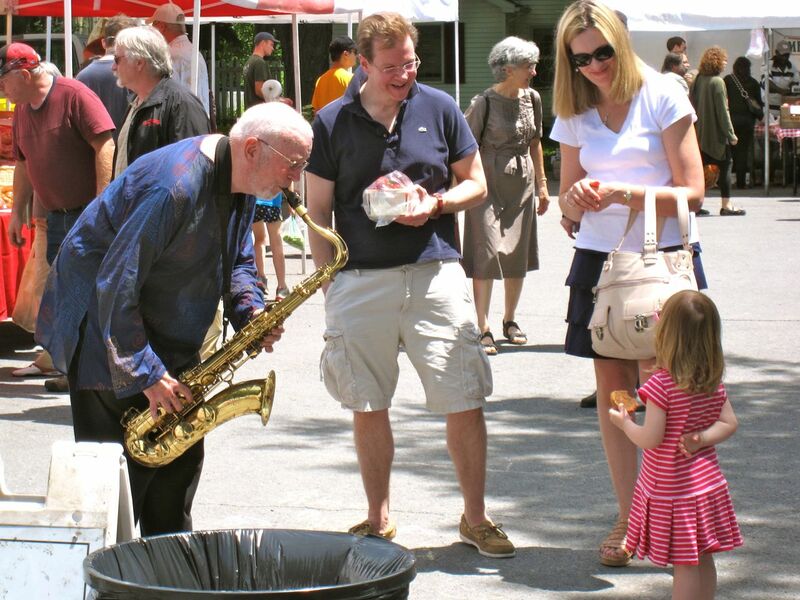 In order to make the event accessible to all families in Ulster County, it’s a free event; families can purchase as many tickets as they wish for each hors d’ouevre, for $2 each. Live music by the school’s band will be performed throughout the event. A silent auction is planned, featuring such items as autographed cookbooks from some of the top chefs in the country, including Tom Collicchio, David Burke, Daniel Orr, and Bill Telepan. Students have designed the event’s logo and website (to follow shortly). The event will also feature food crafts for kids, juicer and smoothie bars, healthy snack alternatives presented by Onteora Home and Career students, a presentation by Hudson Valley author Joanne Michaels on gardening, nutritional information with Lysa Ingalsbe, RN and holistic health coach, and a photo booth. Upon learning about this event, Frontier joined with others as one of the sponsors. We hope sharing the details of this event might inspire you to find ways to help schools or any other institutions in your area move towards using more fresh ingredients from local sources. Please let us know if you’re involved in any projects like this one, we love hearing these stories. Last summer, we had the pleasure of meeting cookbook author Terry Walters at the Rhinebeck, NY Farmers Market. Terry’s first book, CLEAN FOOD, presented recipes that deliciously explained the benefits of eating locally grown, seasonal, and fresh foods. Her new book, CLEAN START, features 100 exciting new recipes designed to inspire you to make that clean start yourself. Terry was kind enough recently to take some time out from her busy book tour schedule to answer a few questions for our blog. Terry, tell us about your earliest realization about clean food — how did it come about for you? I grew up in a home where we sat down as a family to dinner made from scratch every night, where soda was kept in a removed cabinet for company only. Every now and again we would get lucky and mom would let us pick a “sugar cereal.” I knew the difference between junk food and healthy food, but when I was in college, my father had a heart attack and I discovered that I, too, had high cholesterol. My family already ate almost no meat, never drank milk, and ate what we thought was a healthy diet. My choice was to go on cholesterol-lowering medicine, or figure out a diet that would allow me to maintain a healthy cholesterol level. My cookbooks are full of the recipes and information I wish someone had given me all those years ago when I was trying to figure out how to make brown rice and kale both satisfying and delicious! The day we met, your young daughter was helping you with your demo. What is your daughter’s perception of Clean Food? Do you ever have to steer her away from junk food? That was my youngest daughter you met. She never had baby food. When she was 7 months old she reached across the table, grabbed a roll of brown rice and avocado in nori and gummed it until it was gone! She’s always been a healthy eater, but she’s human too. I served kale and collard greens for dinner for years before my girls gave in and started eating them. Now they are among their favorites. We follow the 80/20 rule. At home (80% of the time) we eat clean, so that when we’re out, we can eat whatever we want. My children like the freedom that gives them, but what they don’t realize is that 80% is not only good enough for good health (thankfully), but also enough to influence their tastes and choices the other 20% of the time. We splurge, we treat ourselves and we enjoy a variety of food, but we also talk about how to make healthy choices and empower ourselves with the knowledge to do so. All that said, if you asked my girls what CLEAN FOOD is, they would tell you it’s their mommy’s cookbook! 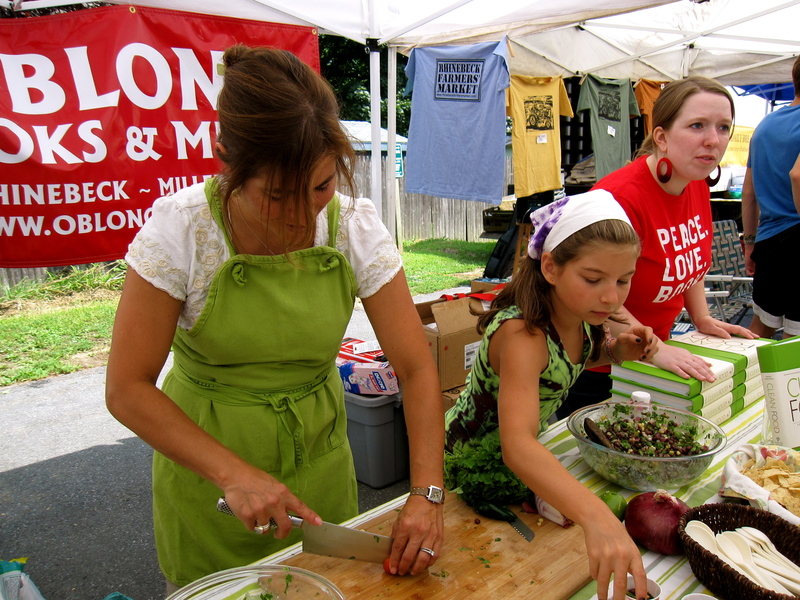 Terry and her daughter at the Rhinebeck Farmers Market. Talk to us a little bit about your whole family’s food habits. How do they manage their meals while you’re traveling on book tours and such? I can tell you that feeding a family-on-the-go is a challenge, and I’m sure many (if not all) of your readers would agree. It’s been clean for my family from the start, but that doesn’t mean it’s not a process and a constant challenge. Even when I’m home, the girls have activities most nights after school, and more often than not I’m picking them up with dinner prepared for them to eat in the car! It’s far from ideal, but I still do my best to make sure it has a rainbow of color and comes from the green kind of plant and not the cement kind of plant! My traveling for work definitely makes things harder on everyone. Sometimes the choices are not nearly as clean as they would be otherwise, and sometimes they’re even cleaner! In the colder months, I make a lot of soups and stews that I freeze so they can have them easily in my absence. I’m blessed to have a mom that not only helps out when I’m unavailable, but also prepares lots of delicious clean food for my husband and girls. My oldest daughter likes to create in the kitchen and has a few healthy meals she likes to prepare. My youngest isn’t nearly as comfortable or even interested in cooking, but before I went on my first trip she asked me to teach her how to make her favorite collard greens so she could have them while I was gone. I know they get more take-out and treats in my absence, but I also know that their comfort foods, the meals and recipes they’ll come back to year after year, are healthy and clean. We watched you at the cooking demo, and you made it look so easy. What’s it like to do cooking demos? Any stories about when things may not have turned out, or you forgot something you needed? I’ve been teaching for over a decade and I’m a mom, so multi-tasking comes naturally to me. Is there any other way? Talk, chop, talk, stir…it’s what I do! I love connecting with others, benefiting from our shared perspectives and wisdom and, of course, sharing the journey. There are all sorts of cooking demos – from 2+ hour in-depth classes to 3 ½ minutes on live television to make 3 recipes and get your message across. I love them all. The message that eating clean can be easy, delicious and help you live a great life is what fuels me. If one person leaves my demo with newly gained tools and the confidence that they can improve their health and diet, then I am happy. One demo, one person at a time…that’s how we’ll change the way we nourish ourselves as a nation. I forget things all the time, but as my mother taught me, “If you put good things in, you’ll get good things out.” Fortunately, that’s been true for me. There have, however, been a couple of tense moments in cooking demos. There was the time when we had 10 minutes left in class to bake the apple crisp. Did you know you can cover a crisp with foil and bake it at 500 degrees? I don’t recommend trying this at home, but it definitely saved me that night! Finally, my favorite blunder was during a class focused on getting children to eat clean. My daughter thought it would be nice if we co-taught the class, so I asked her to show everyone how to make nori crisps. She laid out all the ingredients, was just about ready to go, and then sneezed all over everything! It was clearly a room full of moms who took instant pity on me, and they said, “Don’t worry about it! It’s fine!” which of course it was absolutely not! Everything was cleared and thrown away, the work surface sanitized and a new batch of ingredients taken out to start all over again. She did a great job, but none of us will ever forget it or let her live it down! 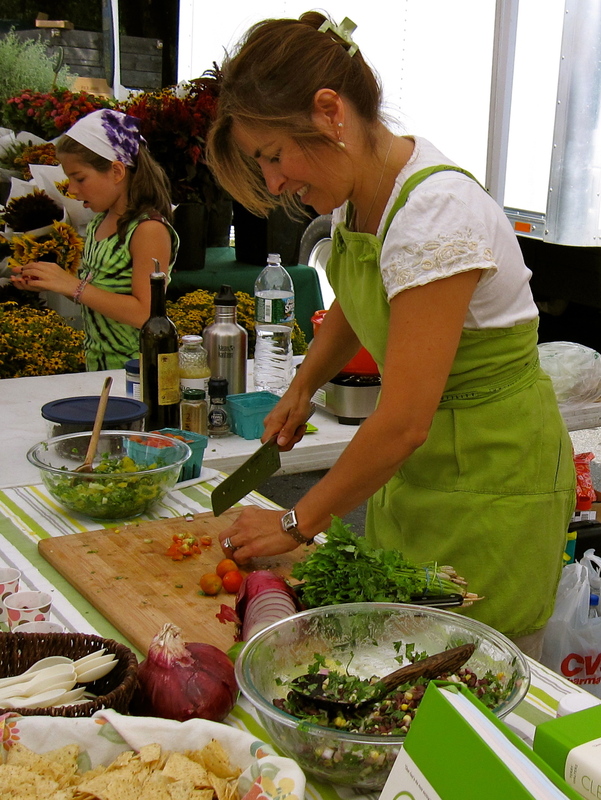 Talk, chop, talk, stir -- the formula for a cooking demo. Have you noticed any particular “fan favorites” from your demos? Favorites really depend on the season. When you and I met at the Rhinebeck Farmers Market, the Yellow Plum and Tomatillo Salsa was definitely the hit that day, and many days thereafter! This past winter, people were devouring my Carrot Cashew Miso Spread, the Shallot Fig Spread and the Red Lentil and Turnip Soup with Parsley – all from CLEAN START. More recently, I’ve made dozens of batches of Cocoa Brownies and I guarantee you there have been no complaints! The Watercress and Fennel Salad with Blood Orange Thyme Vinaigrette is popular, as is are the Stuffed Mochi Dumplings… I could go on and on, and the point just becomes clearer and clearer. We don’t need to sacrifice our good nutrition for convenience. Eating clean is fun, it’s quick, it’s easy and it’s delicious! The day we met you, you were traveling with our cinnamon. Do you have a favorite recipe for our cinnamon? Was it Frontier cinnamon or was it cumin? I recall making my Black Bean Salad, which would have used cumin. It could have been any number of Frontier or Simply Organic products. I grind your milk thistle and flax seeds nearly every morning to add to my granola (which is full of Frontier cinnamon and whole nutmeg), I thicken my soups, sauces and even my brown rice pudding with your arrowroot. My favorite always depends on what I’m craving at any particular moment, but I’ve made a lot of friends by gifting my granola recipe! It’s from my first book, CLEAN FOOD, and you can season it with cinnamon, nutmeg, allspice, cloves…whatever suits you! The key to making delicious granola is to bake it at a low temperature for a long time. Of course, a little bit of shredded coconut and a lot of cinnamon and maple syrup help, too! My husband devours this granola every morning and at the end of each week leaves the nearly empty Mason jar on the counter to remind me to make more. In large bowl, mix together all dry ingredients. In separate bowl, whisk together oil, syrup and almond extract. Pour wet mixture over dry and stir to coat. Transfer granola to 9 x 12-inch glass casserole, spread evenly and push raisins into granola so they are not on the surface. Place on top rack of oven and bake 60 minutes or until golden. Remove from oven and cool completely to set. When cool, slide spatula along bottom of casserole to release granola. Break into chunks, and store in airtight container. As we’re headed into summer, you may want to try my Black Currant Plum Crisp with hints of nutmeg. I don’t think you’ll be disappointed! Crisps are so easy to make and so satisfying – whether you’re serving them for breakfast, a snack or dessert. Make sure your plums are ripe, and be sure to select a variety of plum that is more sweet than tart to avoid ending up with an overly tart crisp. A scoop of vanilla rice cream or ice cream is the perfect accompaniment. Leaving skins on, halve plums, remove and discard pits and slice into thin wedges (about 1⁄4 inch thick). Place in large mixing bowl and set aside. In small pot over medium heat, place currants with just enough water to cover, bring to boil and simmer 5 minutes to soften and plump. Drain well and add to bowl with plums. Add nutmeg and salt, and stir. Add maple syrup and teff flour and stir until plums are evenly coated and ingredients are combined. Pour mixture into 8 x8-inch casserole and set aside. Using same mixing bowl, combine almond meal, teff flour, almonds, nutmeg and salt. Over low heat, melt coconut oil in small skillet. Remove from heat, whisk in maple syrup and vanilla and pour over flour mixture. Stir to combine and crumble over plum mixture. Bake 45 minutes or until top is golden brown and plums are soft. Remove from oven, and cool slightly before serving. Visit Terry’s website for more inspiration about making a clean start, recipes, her blog and much more. She’s on Facebook and Twitter too. 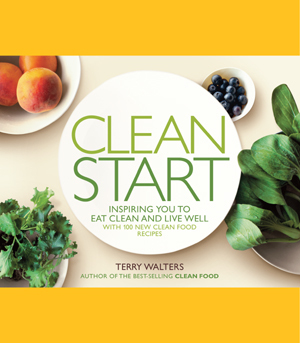 Terry and her publisher, Sterling, have given us 4 copies of CLEAN START to give to you! We’ll randomly choose 4 winners from comments here. Leave yours by May 5, and you’re eligible. 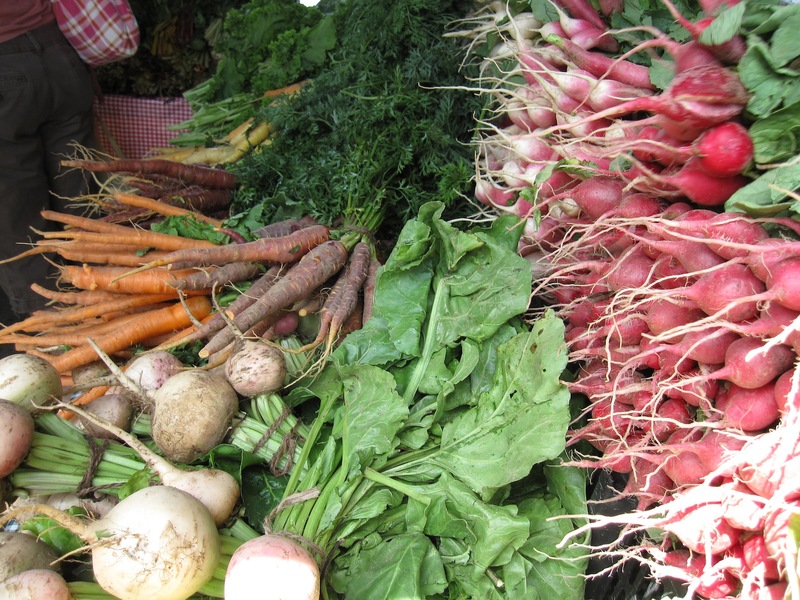 With farmers’ markets on the horizon (finally!) tell us what produce you’re looking forward to finding at your local market, and how you plan to use it in your own healthy cooking. We enjoy giving you some inside views of our operation here in Iowa. Every now and then we post some photos of our employees on Facebook, and our fans there seem to enjoy it. Our blog gives us an opportunity to do the same, and also to go into a bit more detail. 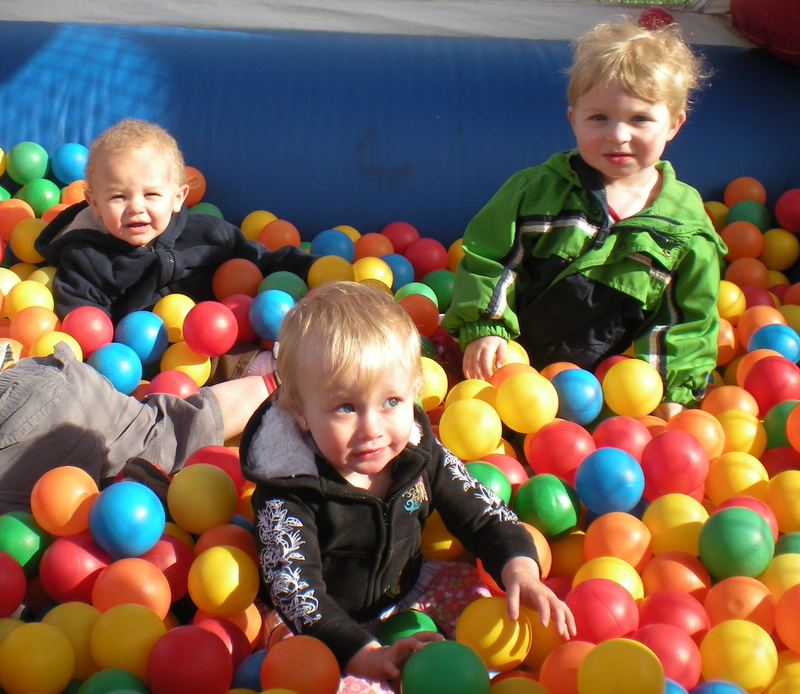 At our Norway facility, as an employee benefit, we operate a state-licensed childcare center that serves around 70 children. Frontier subsidizes about half the cost for our employees, with discounts for multiple siblings. 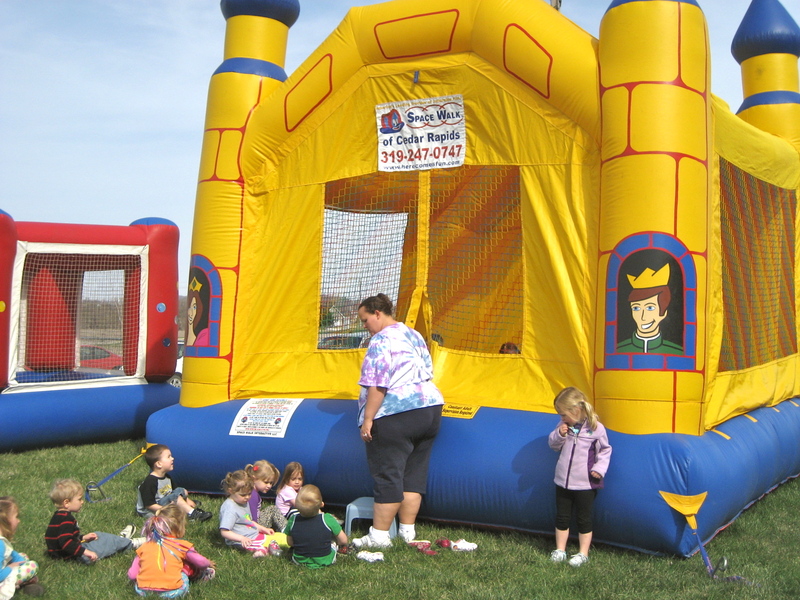 Employees’ children can also enjoy day camp fun during their summer break from school. 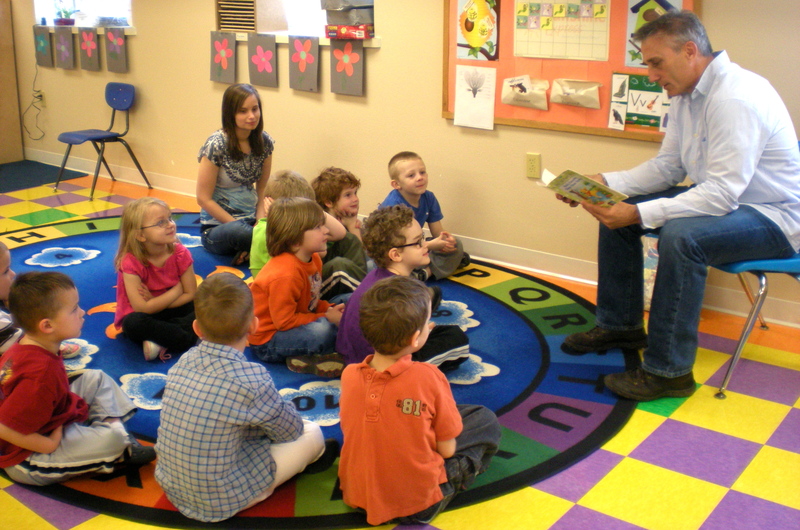 Employees at other locations are provided a subsidy for licensed childcare for their children. 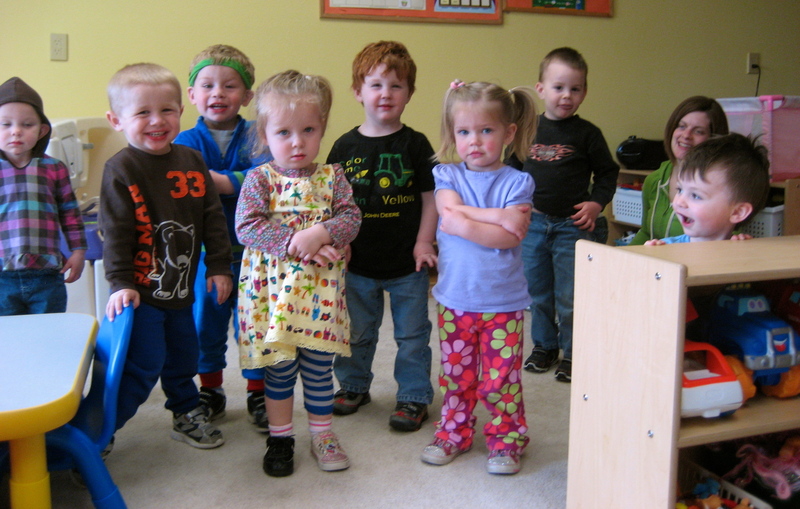 Last week, the kids celebrated the Week of the Young Child, and we snapped some photos on Wacky Day. To the tireless staff at our childcare center, Wacky Day may not have seemed much different than some other days, but it made for some cute photos! You can read more about our employee benefits here. According to a story in today’s Chicago Tribune, at Little Village Academy on Chicago’s West Side, students are not allowed to pack lunches from home. Unless they have a medical excuse, they must eat the food served in the cafeteria. But many parents and students aren’t happy with this mandate, despite Carmon’s intentions. In fact, according to the article, many Little Village students claim that, given the opportunity, they would make sound choices. The lunch at Little Village is $2.25 a day – does this seem high to you? Can you pack a lunch for less than that? Any of us who’ve spent time in a school lunchroom (and that’s most of us) have surely seen kids throw away the food they aren’t eating. So the idea of taking away any options for what they might want to eat seems like it might increase the chance that food is going to be wasted. Clearly, this solution may not be the best plan. What other options are there for improving the nutritional value of school lunches? What’s worked for you in that area? Some schools ban certain foods and drinks, like those with excessive amounts of sugar. Some schools even ban processed foods. What are the rules at your child’s school? Are any foods OK for lunch, or are there rules in place to ensure lunches from home meet set nutrition standards? We’d like to hear your thoughts. Thanks for stopping by.